Regular readers will know that Thom and I also run an under 13 girls side at Havant & Waterlooville. Our girls had kindly been invited to be mascots for Chichester City as they took on Coventry United in the FA Women’s National League Cup third round. 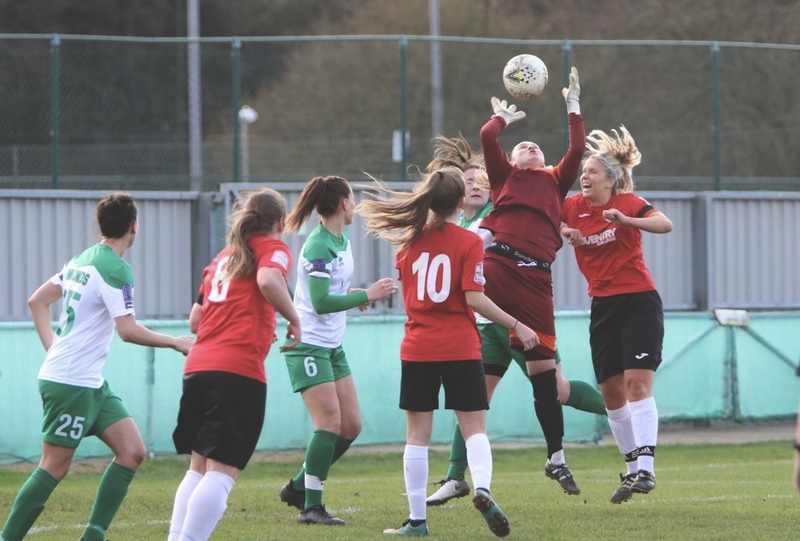 Chichester are currently sitting top of the FA Women’s National League South by two points, although Coventry are two points behind but with two games in hand. I imagine both sides would rather have three points than progress in the cup, although the game was an important opportunity to set a marker and maybe grab a psychological advantage over the other. Coventry started the game strongly and large parts of the early stages were played in the Chichester half. The wing-backs of Lauren Cheshire and Helen Ogle were pushed deep by the offensive Coventry, forcing them into more of a five at the back. Tash Merritt blasted over from an Amber Hughes free-kick while Laura Ingram was called to head clear a dangerous Jade Brook cross in the opening exchanges. Coventry were getting closer to scoring and heaping the pressure onto Lauren Dolbear’s goal. A long range effort smashed the crossbar before bouncing off Dolbear for a corner. Hughes went for a top corner finish from the edge of the box which looked destined to hit the back of the net but Dolbear made a superb save and tipped the shot over and out for a corner. Dolbear was caught off her line but managed to get back to parry the ball with the Coventry forward having what appeared to be an easy tap in, Tammy Waine produced one of the best pieces of defending I’ve seen all season to somehow nick the ball away and deny what seemed a certain goal. Hughes put in an inswinging corner which found the head of Merritt to nod the ball into the bottom of the goal. As Chichester chased the equaliser as Molly Clark went close as her shot hit the crossbar and Helen Ogle unable to put in the rebound. Chichester boss, Aaron Smith, made one change at half-time, bringing on Jade Widdows for Sara Tubby. This was Widdows’ 50th appearance for Chichester and she would have been hoping to make a difference going forward. The second half followed a similar pattern as Coventry dominated and managed to double their lead as Hughes’ low shot went into the bottom corner of the goal. Chichester worked hard to create opportunities with Widdows linking well with Molly Clark to find Ogle but she was unable to get her shot away. Coventry were reduced to ten for the final twenty minutes as Merritt picked up two yellow cards in five minutes. If I’m honest, I cannot remember the first booking but the second was certainly worth a yellow. Clark forced the Coventry keeper, Susan Woods, to tip the ball over her crossbar with a shot 35-yards from goal. Chichester started to put pressure on Coventry and keep the ball in their half although were unable to get the goal they needed. Coventry were well organised and battled ferociously for every ball. For me, no one demonstrated that more than Chenise Austin at left back. 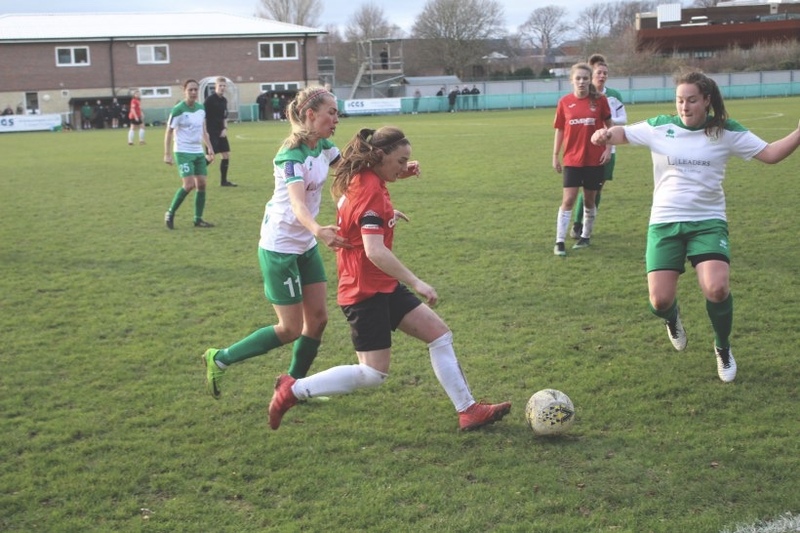 Over the course of the game she came up against top quality players in Ogle, Widdows, Clark and Cheshire but managed to contain them as her side held on for the win and progressed to the quarter-finals of the League Cup where they will now face Crawley Wasps. Thank you again to Hayley, Aaron, Matt and everyone at Chichester for making my girls so welcome. They loved it! Chichester City: Lauren Dolbear, Lauren Cheshire, Tammy Waine, Tiffany Taylor, Laura Ingram, Molly Clark, Rebecca Barron, Gemma Simmonds, Sara Tubby (Jade Widdows 46’), Helen Ogle (Tash Stephens 70’), Cherelle Khassal (Jess Lewry 70’).